Cambrie’s Little Boxes is in our fourth year of raising funds for Cancer Charities and we have already been hard at work gathering Christmas and every day cards from our community…this is how it starts each year. We assess our stock,(which is always entirely depleted) touch base with our tireless volunteers and make contact with our donors who drop off their cards at our front door or call for pickups. We hope to help individuals struggling with cancer. We hope for a successful year of reaching our set goals in fundraising and meeting with the many people in our community who come alongside us to help others in need. Our volunteers are incredible people, each with their own stories and strengths. These people never expect to have their name out there, they never expect to ever have the light shine on themselves, yet they go out of their way to build up our ‘stores’ with all the cards that we could possibly use in the hope that people will buy our boxes and much needed monies will be given to help families with cancer. Many of our volunteers have experienced having cancer themselves so they know the fear and the suffering that is involved in the great fight. 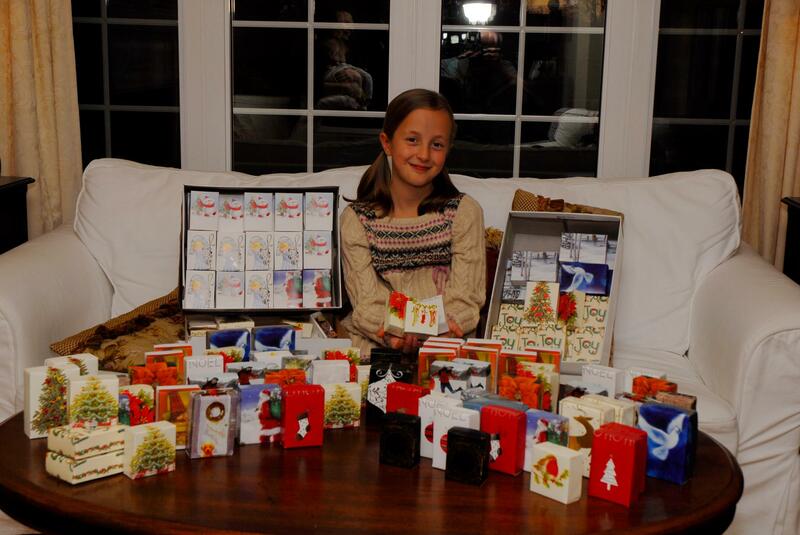 Cambrie’s Little Boxes began when my father, Marcel Gallant, passed away from cancer in 2009. My granddaughter Cambrie wanted to do something to fight cancer, to eradicate the dreaded disease so others would never have to lose their loved ones to it. She had to do something to make a difference, so she and I made a plan on what to do to raise dollars to help fight cancer. She was nine years old at the time. We decided to make little boxes from Christmas cards. She had brought some of these little boxes to our Christmas dinner, one for each person to be placed at their spot at our dinner table. They were so beautiful and lifted our spirits and when I saw those boxes, I just knew, that these beautiful little boxes were to be our fundraising project. So gather we did until we got every card we could find and we began to make boxes. These little boxes sell for 50 cents each. 100% of all sales goes directly to the cancer charities. We support the Canadian Cancer Society (Brant), The London Regional Cancer Centre, and last year added Sick Kids Hospital, for kids with cancer. We thank all those who support us in this work by purchasing little boxes. We are always looking for volunteers. This year, 2013 we are hoping to add 25 new volunteers to our organization, of which we already have commitments from 6 new volunteers. If you are interested in helping please call 519-751-2165. This year we are sensing a different motivation along with our zest to increase our goals and reach deeper. Our eyes are open to a different truth than when we started. Instead of being motivated by the sting of loss, we are finding that It’s the individuals and the families that have filled our hearts with compassion and it is they who ignite something inside of us that motivates us to continue to work even harder and raise even higher amounts each year to help those who are struggling and fighting cancer. Cambrie is now 12 (soon to be 13) years old and wise beyond her years, with a heart full of love and compassion. And when one person in our family carries a torch for something, our whole family follows suit and gets involved. We really must acknowledge our entire family for all they do for Cambrie’s Little Boxes. Their commitment to support us in what we do enables and strengthens us to continue in this work. It has been a privilege for us to meet some of the many generous people in our community who donate their cards to us and volunteer their time. We have heard the stories of so many who have battled cancer and won, also of their loved ones who did not win their battle, yet here they are partnering with us to help others in need. I would love to tell the stories of each of our dedicated volunteers as there is so much to say about each one and the value they bring to our organization is immense. One volunteer named Mickey Bonney is definitely one who deserves recognition. She is a tireless 81 year old lady who collects Christmas cards from her entire apartment building. Bags and bags of cards have come to us do to her efforts. Mickey found us one day and we are so glad that she did. She is a dynamic woman with a drive to help others and bring joy at every turn. And for over a year has kept us near to her heart. Not only does she collect cards for us, but she also sells the little boxes too, lots and lots of boxes. Each time I am there, she has made a special gift for Cambrie, to reward her for working hard for others. I think that she has adopted us both, at least we hope so. She does all sorts of crafts and loves to do plastic canvas. She has made a large sized 3D Mohawk Chapel from plastic canvas. She lost her love this past year, her husband Howard, which was very difficult, however after a time, she pushed herself to keep busy. She continues to help us in our efforts , winter, spring, summer and fall, and she is always there with bags full of cards to keep us busy and a big smile to warm our hearts and we are so grateful to her. Hats off to you Mickey. You are a special lady and so important to the work of Cambrie’s Little Boxes and we couldn’t do it without you girl! Cambrie’s Little Boxes is totally dependent on our community. We are thankful to the individuals, churches and the organizations who donate cards to enable us to make them into little boxes. To our volunteers who make boxes for us, we are so grateful. We thank you for the numerous trips back and forth, picking up cards and dropping off boxes. You are the strength of Cambrie’s Little Boxes and you don’t get near enough praise and pats on the back. We thank each one of you for the time you take to help others and your contribution to Cambrie’s Little Boxes is so appreciated. Thank you to all who are joining hands together with us as a family to achieve great things for individuals in their battle with cancer. We are organizing a summer event in August and soliciting as many volunteers/groups and teams to help out with the event as possible. Watch for more details soon.